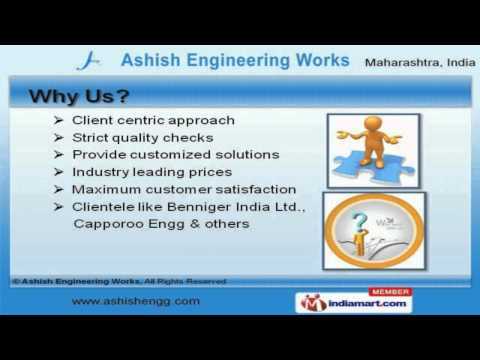 Welcome to Ashish Engineering Works, Manufacturer and Supplier of Heavy Fabricated Equipment&#039;s. The company was established in 2009 at Pune. State of the art infrastructure and highly dexterous professionals help us to achieve a present repute in the market. Strict quality checks and Industry leading prices help us to serve Clientele like Benniger India Limited and Capporoo Engineers. We offer a diverse range of Carbon Dioxide Storage Tanks, Industrial and Ribbon Blenders. We have gained tremendous expertise in providing Pressure Vessels, Heat Exchanger and Fabricated Products. We also provide Process Equipments, Industrial Conveyors and Reactors that are well known for their durability. We are one of the trusted names of the industry engaged in offering genuine quality Industrial Burners, Gas Flare Systems and Tube Bundles. Our clients can avail from us an exquisite range of Tube Condensers, Process Collars and Activated Carbon Towers that are cost effective. Pressure Vessels for Oil and Earth Filters for Chemical Industry are setting a benchmark in the market.